A Master of Destruction wants you to join her in challenging the gods to prove you deserve her training. Once you have a Destruction skill of 70, speak with Delphine Jend in the Bravil Mages Guild or Marc Gulitte in the Anvil Mages Guild to receive the master training recommendation. Bring twenty bear pelts to Bralsa Andaren so she agrees to train you further. Once you have leveled up your Destruction skill to 70, speak with either Delphine Jend, who is a member of the Mages Guild in Bravil, or with Marc Gulitte, also a member of the Mages Guild, in Anvil. They will tell you that if you wish to learn more about Destruction you need to find Bralsa Andaren, a Dunmer who is currently camping near a wayshrine of Kynareth in the Colovian Highlands, attempting to destroy the Divine's creations. Your quest arrow will point to Bralsa Andaren; no map marker will be added, but she can typically be found in the vicinity of the shrine. Before providing training, she asks you to give her twenty bear pelts. 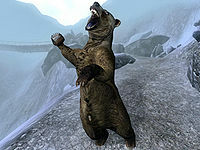 These can be acquired the hard way by killing bears (black bears appear randomly starting at level 9 in most places, or level 7 along roads), or by purchasing them from merchants. Most general merchants have an infinite supply of bear pelts and are therefore easy sources; as soon as you buy the five bear pelts in their inventory, five more will appear. Once you have given them to her, she will agree to teach you more about Destruction. It is possible for Bralsa to be killed by the wildlife. The chances of her dying increase each time you visit her, because most dangerous creatures only spawn when your character is in the area. Therefore, it is advisable to maximize your training each time you visit. Before your first trip to find her, collect all twenty bear pelts and have enough gold to immediately buy five training sessions (i.e., at least 3600 gold). Bralsa may die before you find her due to an Oblivion Gate that may open nearby. If it does, you may wish to close it as soon as possible to avoid her death. After the Destruction Master Training quest is complete, she can be very hard to find since the quest marker is gone. A good way to find her is to wait by her bedroll at 11pm. If she's alive, she will come back to her camp, usually within minutes. Bralsa may take fewer than twenty bear pelts from you. This may be caused by having a combination of stolen and non-stolen bear pelts in your inventory. Bralsa will only take your stolen bear pelts in this case. Like Torbern, Alawen, and Tooth-in-the-Sea, if Bralsa dies before beginning her Master Training quest, the quest can be obtained but not completed, and will stay active. 10 I must seek out Bralsa Andaren if I wish to learn more about Destruction magic. 20 I must bring 20 bear pelts to Bralsa Andaren so that she will agree to teach me what she knows about Destruction magic. 100 Finishes quest I have met Bralsa Andaren's demands, and she has agreed to teach me what she knows. 200 Finishes quest Bralsa Andaren is dead. I can no longer be taught more about Destruction. It is possible to use the console to advance through the quest by entering setstage TrainingDestruction stage, where stage is the number of the stage you wish to complete. It is not possible to un-complete (i.e. go back) quest stages. See SetStage for more information. This page was last modified on 17 August 2018, at 13:36.